Just as in Japan, Portland is experiencing an explosion of color with the blooming of cheery blossoms throughout the city. Wandering through the Portland’s neighborhoods, one is treated to an amazing show of blossoms ranging from dark pink to completely white. The final act of the show takes places when breezes start to blow creating a “raining petal” effect. 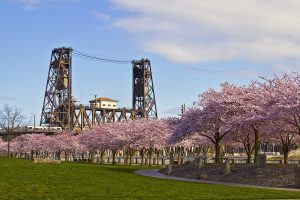 One of the best places to view the cherry blossoms is the Japanese American Historical Plaza along the banks of the Willamette River in central Portland. These trees were planted in 1990, and provide an excellent spot for “o-hanami” cherry blossom-viewing picnics.